While following the 2016 United States presidential election through social media and ‘fake news’ outlets, I was reminded of the significance of personality in creating social and political change. The personalities of Donald Trump and Hillary Clinton were constantly juxtaposed and used by opposition groups to discredit the presidential candidates. After Donald Trump was elected, other world leaders’ personalities were dissected based on their responses to Trump’s policies. When Trump released an executive order that suspended the “Issuance of Visas and Other Immigration Benefits to Nationals of Countries of Particular Concern”—seven nations with Islam as the dominant religion—the responses of world leaders created an important discussion about diplomacy and character. Some opposed to the Trump administration applauded German Chancellor Angela Merkel for censuring the Trump administration and Canadian Prime Minister Justin Trudeau for tweeting that refugees were welcome in Canada, no matter their religion. Trudeau was also criticized by some for not denouncing the executive order, like Merkel, and was called on to show moral courage. Others suggested that Trudeau was walking a fine line by proclaiming Canada’s principles while maintaining workable diplomatic relations to protect the Canadian economy. The current discourse on the personalities of world leaders coincides with my own interest in the role of personality in intergovernmental relations and between non-governmental and governmental actors. As recent scholarship by historian Raymond B. Blake demonstrates, the personalities of Canadian politicians can have a significant impact on personal relations between government officials, as well as on public policy decisions. Creating political and social change often depends “on relationships and a capacity for compromise.” Drawing on this research, I have begun to consider how personality shaped abortion access in Atlantic Canada in the late twentieth century. In addition to diplomatic and intergovernmental relations, personalities also influenced the ability for state and non-state actors to reach a compromise. 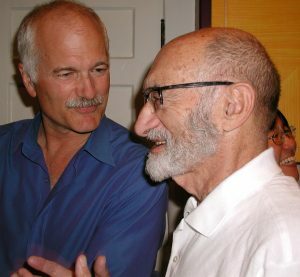 An inability to compromise came to the forefront during interactions between Henry Morgentaler, an abortion rights activist and doctor, and the premiers in the Atlantic region over freestanding abortion clinics. After the decriminalization of abortion in Canada in 1988, the majority of the provincial governments declared their opposition to abortion clinics and declined Morgentaler’s offer to work with the governments to improve access to abortion services across Canada. Morgentaler argued that governmental opposition to his abortion clinics in the Atlantic Provinces was particularly personal in nature. For example, when Premier John Buchanan reportedly stated, “One way or the other we’re going to keep him away,” Morgentaler viewed this as a personal attack. He offered the clinic at cost to the Nova Scotia government and said he would stay out of the province if the government ensured all Atlantic Canadian women could use the clinic. Instead, the Nova Scotia government passed anti-abortion clinic legislation under the Health Services and Insurance Act, which prohibited funding for abortions performed in non-hospital settings. The Act to Restrict Privatization of Medical Services, which was “designed primarily to outlaw abortions performed outside a hospital,” created upset within the Nova Scotia medical community because it “effectively denie[d] physicians the right to perform such diagnostic services as mammography, ultrasound, nuclear medicine and scoping procedures outside a hospital.” Pro-choice activists said the new health regulations could be termed “the keep Henry Morgentaler out of Nova Scotia regulations” because of the personal nature of the government’s opposition to the abortion clinic. Personal attacks against Morgentaler were not new. Whether the dislike stemmed from anti-Semitism, strident opposition to abortion, or an aversion to someone flouting ‘the law of the land,’ it is evident that a person’s perception of the man certainly shaped their disapproval of the Morgentaler clinics. Investigating Morgentaler’s personal communications with the premiers indicates, however, that the doctor heightened tensions and animosity through his own personal attacks. When the provinces demonstrated an unwillingness to work with Morgentaler to establish clinics, he vociferously criticized both premiers and ministers. In his correspondence with the Nova Scotia premier, Morgentaler called on Buchanan to “rise above ego or whatever religious or political considerations have prompted you’ to outlaw free-standing clinics.” When corresponding with Premier Frank McKenna in 1995, Morgentaler similarly condemned the premier for his unwillingness to fund abortion clinics. Morgentaler asked McKenna, “Is your Liberal Party of New Brunswick, impregnated by your personal misogyny, going to fight the Liberal federal Minister of Health? What for? To victimize and oppress a few hundred women per year?” Morgentaler asked McKenna to set aside his “machismo” and choose a sensible solution to the abortion clinic issue. Morgentaler also attacked the provincial ministers of health. In a letter to PEI’s Minister of Health and Social Services Wayne Cheverie, a proclaimed anti-abortion politician, Morgentaler accused Cheverie of “benign neglect,” “moral cowardice,” and misogyny. In these interactions, Morgentaler did not mince words. Like many public figures, his personality endeared him to many, and appalled others. The debates over the role of abortion clinics in the public health care system are complex and cannot be minimized to personal relations. And yet, the premiers’ dislike of Morgentaler combined with his own personal attacks against the character of politicians certainly impeded a working relationship between the provincial governments and the doctor. While there are innumerable factors that shaped opposition to abortion clinics in the region, exploring personal relations and emotional responses might provide insight into why some interactions between government officials and non-state actors failed. Raymond B. Blake, “Politics and the Federal Principle in Canada: Newfoundland Offshore Oil Development and the Quest for Political Stability and Economic Justice,” The Canadian Historical Review 96, 1 (March 2015): 34; Raymond B. Blake, Lions or Jellyfish: Newfoundland-Ottawa Relations Since 1957 (Toronto: University of Toronto Press, 2015). “N.S. Rejects Morgentaler Clinic Offer,” The Globe and Mail, 25 May 1989. “Nova Scotia MDs Angered by Legislation Outlawing Services Performed in Offices,” The Medical Post, 20 June 1989. Andrea Knight quoted in “Clinic Will Shut Down if Advice Not Wanted,” The Daily News, 25 May 1989. “Buchanan Declines Offer to Take Over Clinic,” The Daily News, 25 May 1989. Provincial Archives of New Brunswick, RS765, File 10-6177, Henry Morgentaler, “Public Letter to Premier Frank McKenna,” 18 October 1995. Freedom of Information and Protection of Privacy Request, Prince Edward Island Department of Health and Wellness, Letter from Dr. Henry Morgentaler to Minister of Health and Social Services Wayne D. Cheverie, 3 January 1991.